B68K was successfully added to your cart! B68K could not be added as a favorite. Please make sure you are logged in. 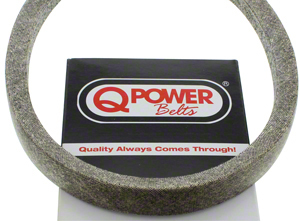 Q-Power® V-Belt 5/8" wide, 71" long when measured around the outside of the belt. Universal fit belts work on all kinds of farm equipment from combines to lawn mowers. Q-Power® V-Belts are designed specifically for agricultural equipment and are built to ASAE specifications using the most advanced methods and with the highest quality materials which include a high wear cover, a KEVLAR® reinforced rubber compound, and KEVLAR® tensile members.